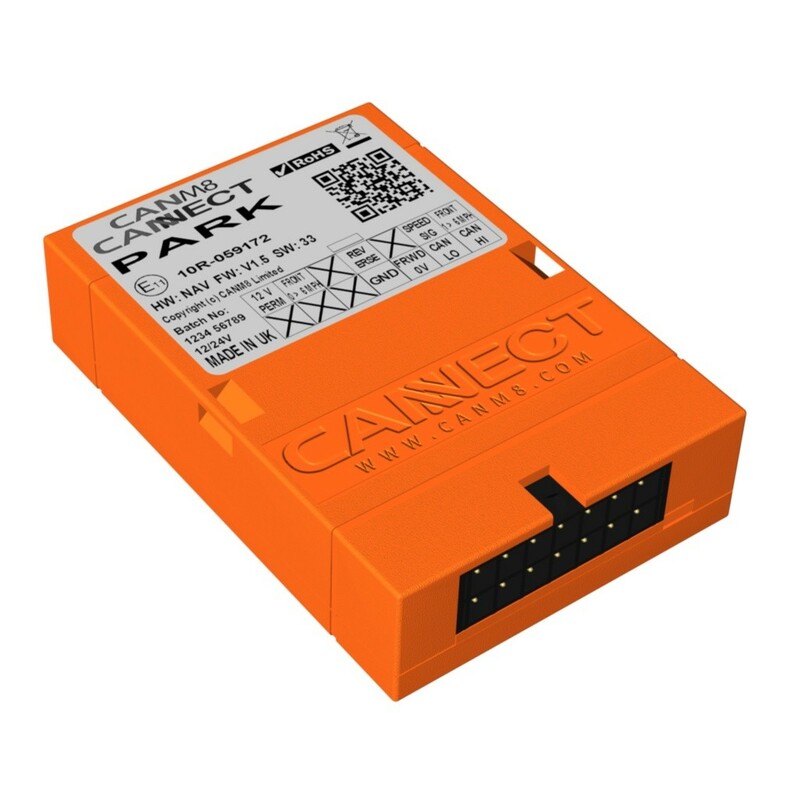 The CANM8 CANNECT PARK interface is a multi-output CAN Bus interface designed to provide a universal solution for installing after-market parking sensors to vehicles which feature CAN Bus wiring. In addition to the front parking sensor control features, the interface also provides a speed pulse output and a 12v / 24v output when reverse gear is selected. Speed Signal > 12v / 24v square pulsed output at approximately 1 pulse per 1 MPH. Speed > 12v / 24v (1A max) when the vehicle speed is 0 - 6 MPH. Speed > 12v / 24v (1A max) when vehicle speed is detected up to 6 MPH. Reverse > 12v / 24v (1A max) when reverse gear is selected. Forward Control > 0v (1A max) when reverse gear is NOT selected. N.B. The speed output will turn off when the park brake is applied on compatible vehicles. The CANM8 CANNECT PARK is an ideal solution for use when installing after-market parking sensors. The interface provides 2 speed dependent outputs, either of which can be untilised for controlling front parking sensors. A 12v / 24v output is generated by the interface as soon as speed is detected and switched off while the vehicle is above approximately 6 MPH. An alternative output provides power control from zero speed to 6 MPH. The interface also provides a negative control output which can be used to power a front parking sensor system for forward motion only. This has the effect of disabling the front sensors while the vehicle is reversing so as not to create confusing tones from front and rear sensors at the same time. This connection is optional and if the front parking sensors are preferred operational while the vehicle is reversing, the negative supply wire to the front parking sensor module should be connected to a permanent 0v point. The interface features a mini wiring connector, which unplugs to allow easy installation. There are 2 connections to the vehicle CAN Bus wiring (CAN HI & CAN LO) along with a connection to a permanent, fused 12v / 24v power supply and an earth connection. RED > Connect via a 5A fuse to a PERMANENT 12v / 24v supply. GREEN > Speed Signal Output : 12v / 24v pulsing (1 Hz = 1 MPH approx). PURPLE > Speed Dependent Output : 12v / 24v (1A max) when the vehicle speed is 0 - 6 MPH. ORANGE > Speed Dependent Output : 12v / 24v (1A max) when vehicle speed is detected up to 6 MPH. BROWN > Reverse Output : 12v / 24v (1A max) when reverse gear is selected. PINK > Forward Control Output : 0v (1A max) when reverse gear is NOT selected.